Prognosticating About Politicians: King of Swords Reversed — or, Mitt Romney Falls From Grace? This week I’m unveiling a new feature for the site: weekly predictions about the U.S. presidential campaigns! Every Sunday I will draw a card and make a forecast as to what will happen that week in election news. Now, bear in mind that I don’t know what the hell I’m doing and I don’t follow political news very closely (though perhaps this will inspire me to do so). Still, it should be fun. So today I drew the King of Swords — reversed! I’m thinking the Republican frontrunner — would that be Mitt Romney? — will experience a sudden fall from grace. Being at the top of the polls isn’t always good for people — I think it may be making Romney overconfident to the point that this week, he’s going to do something stupid — put his foot in his mouth, make a faux pas, possibly do something unethical or have some past breach of conduct revealed. It’s going to make him look like an arrogant bully and his numbers will drop. Why do I say that? Well, a king says to me a frontrunner — an heir apparent — which is why I’m looking at Romney. 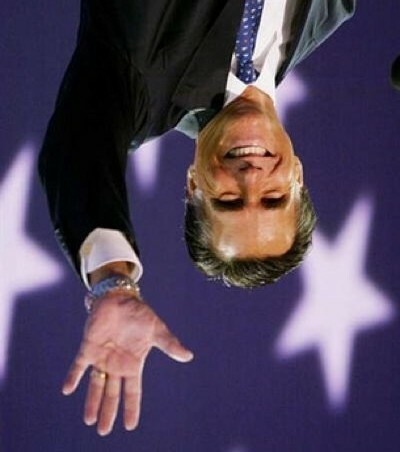 Literally speaking, an upside-down king would fall from his throne, which is why I’m predicting a drop in Romney’s numbers, or a fall from grace. A reversed king to me also means power that is in some way out of balance. 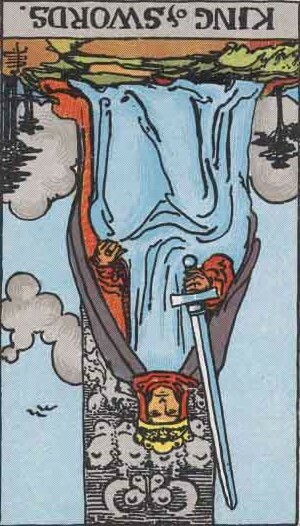 And swords are associated with control, decisiveness, intelligence, confidence — but here the card is reversed. So a fall from grace connected with the reverse of intelligence — stupidity — or with an imbalance of confidence — overconfidence — feels right to me here. Let’s see what happens! Again, I want to remind you that all these predictions come with the caveat that I truly don’t know what the hell I’m doing. Just drawing the card, making the best prediction that I can as a learning exercise. Your comments are encouraged and appreciated! !